For better understanding the impact of multiple applications on the possible residue risk of pesticides on vegetables, a field trial was performed to evaluate eight pesticides (Phoxim, dichlorvos, cyhalothrin, ?-cypermethrin, deltamethrin, fenvalerate, dimethoate and chlorothalonil) on bok choy. The dissipation of the selected pesticides was monitored after once application (OA) or multiple applications (MA). The suitability of multiple applications strategy of the selected pesticides for pest management on bok choy was also evaluated. The deposition ratio for all the pesticides ranged from 0.77‰ to 9.7‰. Dissipation of all the pesticides followed a typical first-order pattern. The estimated degradation half-lives of all the pesticides ranged from 0.6 to 11.95 days and from 0.68 to 11.87 days for OA and MA, respectively. However, the practical concentrations of all the pesticides measured at 2 h after the last application raged from 1.43 to 14.61 mg kg-1 and from 2.34 to 21.29 mg kg-1 for OA and MA, respectively. It is acceptable for the recommend doses for phoxim, dichlorvos, cyhalothrin, and ?-cypermethrinon on bok choy for OA or MA in the present study. For the sake of food safety and sustainable use of pesticides, however, special attention needs to be paid to the MA of deltamethrin and fenvalerate. The MA of dimethoate and chlorothalonil on bok choy was not recommended. applications, higher dosage than needed, application too close to harvest(Chen et al., 2011;Cserháti et al., 2004).Misuse of pesticides may result in environmental pollution, resistance in the target pest organisms and deleterious effects on non-target organisms(Bakirci et al., 2014).Moreover, humans could come into contact with pesticides through the food chain. To ensure the safety of food for consumers, the levels of pesticide residues allowed in food stuff are legislatively controlled through setting MRLs. In addition, MRLs help ensure the proper use of pesticides through authorization and registration (application rates and pre-harvest time intervals). Pesticides are widely used in vegetables because they are susceptible to insect and disease attacks(Bempah et al., 2012).In order to get maximum benefits from these agricultural products, farmers usually overuse pesticides to increase yield or obtain good appearance of the products. Leafy greens are frequently contaminated by pesticides due to inappropriate use of pesticides during their short growing season. There are many dissipation studies of pesticide residues on a variety of crops reported in the literature(Chen et al., 2011;Bempah et al., 2012;Fan et al., 2013;Wang et al., 2014;Sun et al., 2012;Knežević and Serdar 2009;Chavarri et al., 2004).However, limited information is available regarding to the effect of multiple applications on the magnitude of pesticide residues in vegetables. More attention needs to be paid on determining appropriate application strategies of pesticides to balance out the production and safety of vegetables. Phoxim, dichlorvos, cyhalothrin, b-cypermethrin, deltamethrin, fenvalerate, dimethoate and chlorothalonil are commonly used on many kinds of leafy vegetables in China.For better understanding of the impact of multiple applications and possible residue risks of a pesticide, a field trial was designed to evaluate whether the established application strategies result in excessive use of selected pesticides in bok choy.The purpose of the study was to assess the degradation pattern of the selected 8 different pesticides on bok choy with different frequency of applications, and thus help to provide some information for guiding proper usage of pesticides on leafy vegetables. Details of the commercial formulation and recommended application rate of the selected pesticides are listed in Table 6. Standards of the pesticides (certified analytical standard, 98.5-99.7%) were purchasedfrom National Standard Company (Tianjin, China). Acetone, n-hexane, acetonitrile, NaCl, anhydrous Na2SO4 were of analytical grades purchased fromKermel Chemical Reagent Co., Ltd (Tianjin, China). SCAA-104membranes (0.2 mm) and florisil SPE cartridges (500 mg) were obtained from AnpelScientific Instrument Co., Ltd (Shanghai, China). The field trial was conducted at the Experiment Station of Jiangsu Academy of Agricultural Science located in Nanjing.The parameters of the soil of the experiment area: sandy loam texture, sand 30%, silts 54%, clay 16%, and organic matter 1.69%. Both row spacingand inter-plant spacing for bok choy planting were 30 cm. A buffer zone was used between plots with different treatments. The average temperature was 7 ± 9 ºC during the experiment period. The 8 selected pesticides were divided into 3 groups based on the reported degradation half-lives. 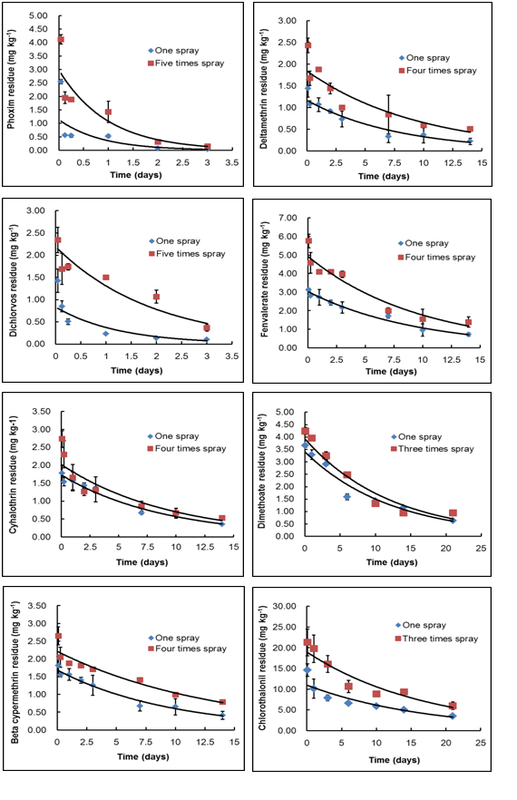 For those pesticides with shorter half-lives, like phoxim and dichlorvos, more application times and shorter intervals were set in the experiment. For dimethoate and chlorothalonil with longer half-lives, fewer application times and longer reapplication intervals were used. Six treatments were carried out, and each treatment had threereplicates. The information of each treatment was as follows. Treatment 1, a mixture of dimethoate and chlorothalonil was repeatedly applied 3 times with 4 days between applications. The first application was carried out on 1st November. Treatment2, a mixture of cyhalothrin, b-cypermethrin, deltamethrin, and fenvalerate was repeatedly applied 4 times with 3 days between applications, and the first application was carried out on 1st November. Treatment 3, a mixture of phoxim and dichlorvos was repeatedly applied 5 times with 2 days between applications, and the first application was carried out on 3rd November. Treatment 4, 5, and 6, the pesticide mixtures in treatment 1, 2, and 3 were sprayed once. The application was carried out on 13thNovember. The pesticides were sprayed usinga JACTO-HD400 backpack sprayer (Tulatin, USA). Three representative bok choy sampleswere collected randomlyfrom each plot at 0.08 (2 h after application), 1, 3, 5, 7, 10, 14, and 21 days after the last application. All samples were homogenized using a blender(Philips, China) and stored at-20°C until analysis. An aliquot of homogenized plant sample (5.0 g) was placed into a 50-mL centrifuge tube, 10 mL of acetonitrile and 2 g of sodium chloride were added, and then the tube was vigorouslyshaken for 5 min using a vortex mixer at the maximum speed. The extracts were centrifugedfor 2 min at 5000 rpm. An aliquot of 2 mL supernatantwas ready for cleanup. A Florisildisposable cartridge was conditioned sequentially with 5 mL of acetone/n-hexane (1:9 V/V) and 5 mL of n-hexane. The 2 mL above-mentioned supernatantwas transferred to the cartridge, and then the cartridge was eluted with 10mL of acetone/n-hexane (1:9 V/V). The eluent was evaporated to dryness under a gentle nitrogen stream with a water bath at 40 (±1) °C. The residue was dissolved in 1 mL of n-hexane for GC-ECD analysis. Another aliquot of homogenized plant sample (5.0g) was extracted and purified with the above method, but the final residue was dissolved in 1 mL of acetonitrile for LC-MS/MS analysis. The GC analysis was performed with an Agilent 6890N system (USA), with autosampler injector and electron capture detector (ECD). The chromatographic column was HP-5 (0.25 μm film thickness, 30 m length, 0.25 mm i.d., J&W Scientific, USA). The inlet temperature was 250°C, initial oven temperature was 150°C, held for 2 min, and then the temperature was increased to 270°C at a rate of 6 °C min-1and held for 23 min. The temperature of the detector was 300°C. The carrier gas was nitrogen and the injection volume was 1 μL. The LC-MS/MS analysis was performed on an Agilent 1200 series LCequipped witha triple-quadruple mass spectrometer (Palo Alto, CA, USA). The analytical column was an Agilent ZORBAX SB-C18 narrow-bore 2.1×150mm 3.5-micron column with a 4×2.0 mm Security Guard C18 (5μm) column (Phenomenex, Torrance, CA, USA).The analytical column was maintained at 25°C. The mobile phase was consisted of 0.1% formic acid in water: acetonitrile (20: 80, v/v). The flow rate was 0.25 mL min-1 and the injection volume was 5 μL. Detection of analytes was performed in the positive mode (ESI+) with multiple reactions monitoring (MRM). For each compound, two or three mass fragments were monitored with one fragment used for quantification and the other fragments used for the additional confirmation of identity. The MRM transitions are reflected in (Table 1). Other parameters of MS/MS were as follows: Drying gas: nitrogen, 10 L min-1; Drying gas temperature: 350°C; Nebulizer pressure, 25 psi; Capillary voltage: 4 kV. Average recoveries and relative standard deviations (RSDs) of the pesticides in bok choy were first obtained to evaluate the method performance by analysis of three replicates of spiked samples at two different spiked levels of 0.1 and 1.0 mg•kg-1. All blank and spiked samples were treated the same as the practical samples throughout the process. A solvent blank and matrix blank were processed through the entire procedure and analyzed prior to and after every 10 samples. Working standard solutions were run at the beginning of sample analysis to determine peak response and evaluate peak resolution. The average recoveries of the pesticides were in the range of 86.0 - 101.7% with the RSD in the range of 1.91%- 11.6% (Table 2). The limit of detection (LOD) and limit of quantification (LOQ) were determined as signal-to-noise ratio of 3:1 and 10:1, respectively. The LOD and LOQ of the pesticides are shown in (Table 2). A good linearity was obtained for each pesticide, with correlation coefficient greater than 0.99. All the target pesticides were not detected in any blank samples. The matrix effect of the present method was investigatedby comparing standards in solvent with matrix-matched standardsfor five replicates at 0.1mg·kg-1. The relative responses (response matrix/response solvent) of all above pesticides were <1.05. The resultsshowed that no interfering endogenous peak appeared,and the matrix did not significantly suppress or enhance the responseof the instrument. The degradations of pesticides were described by the first-order function (Ct = C0×e−kt), where Ctis the concentration (mg·kg−1) at time t (days) after application, C0 is the initial concentration (mg·kg−1) and k is the first-order rate constant (day−1).The degradation half-lives (t1/2) ofthe pesticides in each experiment were obtained by the function t1/2 = ln2/k.Time for the pesticides to degrade to MRL value was defined as tMRL, and tMRL was also calculated by the first-order function when Ct equals to the MRLs of the pesticides. Deposition ratio (D.R.) was introduced to evaluate the amount of the pesticides caught by bok choy shoot with OA. Deposition ratio (D.R.) was calculated with the initial concentration in bok choy after OA divided by the spray concentration. Independent Samples t-test was used to compare the differences of the pesticides between two different treatments. Pearson correlation coefficient analysis technique was applied in order to observe the relations among deposition ratio and physical chemical characteristics of the pesticides. The level of statistical significance was defined at p < 0.05 or p < 0.01. All statistically analysis was performed in SPSS 16.0 software. The D.R. for all the pesticides ranged from 0.77‰ to 9.74‰ (Table 3). Pearson correlation results of D.R. and physical chemical characteristics of the pesticides, such as logkow, vapor pressure and molecular weight, are shown in Table 4. The dissipation pattern of the 8 pesticides at different application times in bok choy investigated is shown in Fig. 1. The degradation of all the pesticides followed a typical, first-order pattern. The first order kinetic equations and correlation coefficient (r2) are shown in Table 7. Application information, initial deposition and half-life are summarized in Table 5. Practical concentrations of the pesticides measured on the day of last application ranged from 1.43 to 14.61 mg·kg-1 for OA, and from 2.34 to 21.29 mg·kg-1 for MA. Estimated degradation half-lives of the pesticides calculated from the data ranged from 0.6 to 11.95 days for OA and from 0.68 to 11.87 days for MA. Among the pesticides studied, phoxim had the shortest half-life of all the pesticides studied and chlorothalonil had the longest half-life. Even though the initial concentrations of OA and MA were different for each pesticide, the half-lives of both treatments for each pesticide did not show significant difference. Degradation of phoxim and dichlorvos on bok choy was greater than 84% for both treatments 3 days after the last application. In the study, the dissipation rates of 4 pyrethroids including cyhalothrin, b-cypermethrin, deltamethrin and fenvalerateall fromП-type (withα-cyanogroup)were similar. The dissipation rates ranged from 77.2% to 84.7% with OA and from 70.5% to 80.6% with MA, respectively. The dissipation rates of dimethoate with one time and three times sprays were 82.6% and 71.9%, respectively, 21 days after the last application. For the only organochlorine pesticide chlorothalonil, the dissipation rates with OA and MA were 76.1% and 71.9%, respectively, 21 days after the last application. According to the results of this study, negative relations were found between D.R. and either logkow, vapor pressure, or molecular weight. However, no significant correlation is observed at p < 0.01 level. It can be concluded that the D.R. was probably affected by other factors, for instance, formulation of the pesticides, spraying technique, dilution ratio, adjuvants, pesticide wetting ability, etc. (Table 4). TheDissipation ratioof pesticides on plantswas determined bythe application methodsand times, depending on thetype and properties of the pesticides. Thedegradation of phoxim and dichlorvos on bok choy was greater than 84% for both treatments 3 days after the last application. Phoxim has been reported to disappear rapidly in the environment (Wang et al. 2011) and even disappear within hours of application on plant leaves in summer (Rotich et al. 2004). Phoxim hydrolyzes rapidly in water and its maximum wavelength of absorption (282 nm) is close to the lowest wavelength of sunlight (Rotich et al. 2004). Therefore, photodegradation and hydrolysis are probably the main degradation processes for phoxim. The result in this study is in accordance with these previous studies. As is shown in Table 3, the vapor pressure of dichlorvos is at least four orders of magnitude higher than any other pesticide, which means dichlorvos has the highest volatility of the selected pesticides which could probably explain its fast dissipation in bok choy. For the other studied organophosphorus pesticide dimethoate, the degradation rate was much slower than phoxim and dichlorvos. pesticides was much longer than their PHIs. According to the growth period of bok choy (35 days from planting to harvesting), if dimethoate and chlorothalonil are applied on bok choy, either the recommend doses should be reduced or the PHIs should be extended for the sake of food safety and sustainable pesticide use. In conclusion, the dissipation of all the pesticides studied followed a typical, first-order pattern.The recommend doses for phoxim, dichlorvos, cyhalothrin and b-cypermethrinon on bok choy for OA or MA were acceptable.However, special attention needs to be paid to the MA of deltamethrin and fenvalerate. The MA of dimethoate and chlorothalonil on bok choy was not recommended. This study was financially supported by the Independent Innovation Fund of Agricultural Sciences in Jiangsu Province (cx (12) 3090)，and the National Natural Science Foundation of China (Grant NO. 31540003). Table 1 Parameters on MRM transitions of LC-MS/MS. Table 2 Recoverys (Â±RSD), LOD and LOQ of the target analytes. Table 3 Physical chemical properties of the studied pesticides. Table 4 Pearson correlation analysis among logkow, vapor pressure, molecular weight and deposition rate of the pesticides studied. Table 5 Application information, initial deposition, half-life and tMRL of the pesticides in pakchoiunder the field conditions. Table 6 Information of the pesticides studied in the field trail. Figure 1 Dissipation of the pesticides with different appilication times in bok choy.